In nine three-day sessions spread over nine months, the Continuum provides participants with ample opportunity both to learn and to apply new techniques. Par will develop actual cases from their own practices, beginning with diagnosis and treatment planning, proceeding through surgical guide fabrication and 3-D image analysis, and culminating in implant placement. Each participant has the opportunity to place single and multiple implants under the careful guidance of the Triangle Dental Institute faculty. 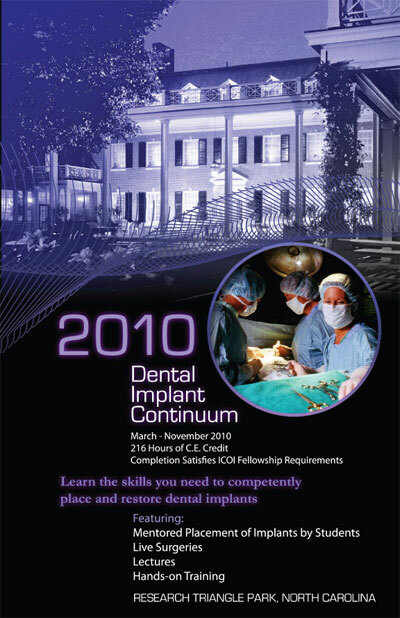 The Dental Implant Continuum qualifies for 216 hours of C.E. Credit and satisfies the requirements for the ICOI Fellowship. Technique labs, which begin at 10:00am each Friday, feature live surgeries, lectures on the science and techniques behind the surgeries, and hands-on workshops. 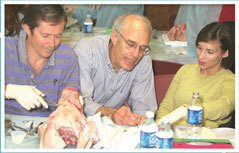 Forty-plus hours of hands-on workshops enable participants to visualize the intricacies of lecture material. Through watching, listening, and practicing, participants gain both knowledge and proficiency in cutting-edge techniques. Each Saturday and Sunday from 8:30am to 5:00pm, featured speakers provide in-depth information in their particular areas of expertise (see Course Schedule, pp.4-8). Throughout the course, representatives from the major implant systems, specialty instrument manufacturers and grafting material suppliers will be on-site to ensure that the participants gain a broad understanding of all products and techniques available. Since successful implant dentistry depends upon the involvement of the entire practice, the November session provides the opportunity for participants to train and certify (ICOI) their team members.. The goals for this session include incorporating implant surgery into participants’ practices and providing staff with the skills and confidence necessary to assist in placing implants. Together, teams will view live surgeries and attend lectures on case presentation, office organization and implant maintenance. In special break-out sessions, team members will learn how to set up specialized equipment and how to effectively assist throughout the entire implant process. All lectures and laboratory sessions take place in a state-of-the-art facility located just minutes from the Raleigh-Durham International Airport (RDU). The Research Triangle Park area is unparalleled in its commitment to research and technology, its beauty and its Southern hospitality. Dr. Mark Hunt earned his BA and DDS from the University of North Carolina at Chapel Hill and is a Fellow of the ICOI. He maintains a private practice in Durham, North Carolina, with an emphasis on aesthetic and implant dentistry. For the past five years, Dr. Hunt and his staff have organized annual dental mission trips to Haiti and Central America through East Chapel Hill Rotary Club. In 2005, Dr. Hunt established the Triangle Dental Institute to educate dentists in dental implants and bone grafting. Dr. Holland received his DDS from the University of North Carolina at Chapel Hill and is a Fellow of the ICOI. He founded Sally Industries, a robotics and animation company, while maintaining a private practice in Jacksonville, Florida. He has developed a dental office management software program, “The Dental Executive,” to improve office efficiency and has produce videos for dental office repair and maintenance. Dr. David Simpson is a Diplomate of the American Board of Periodontology. He has been one of UNC-Chapel Hill’s most popular faculty members during his 30-plus years association with the Dental School, serving as Department Chair from 1987-1994. He now maintains a private practice in Raleigh, North Carolina focusing on periodontics and dental implants. Dr. Gittelson is the founder and director of The Center for Implant Prosthetic Education and Training, which offers lectures and hands-on courses on the science of occlusion and implant prosthetics. He is a fellow of the ICOI and an affiliate member of the International College of Prosthodontists. Dr. Gittelson was the 2002 recipient of the Dr. Charles E. English award fro the most clinically relevant article published in the Journal of Implant Dentistry, and he currently maintains a private practice in Merrick, New York, which focuses on implant prosthetics. Dr. Marchack is director of the San Gabriel Valley Dental Study Club and Associate Professor at the University of Southern California, and he has a full-time practice in Pasadena, California. He has lectured nationally and internationally, has written numerous articles in peer review journals, and is on the Editorial Review Board of The International Journal of Oral and Maxillofacial Implants. He is the recipient of The Judson C. Hickey Scientific Writing Award for the best dental technique article of 2007. Connective Tissue Attachment: What is the Long-Term Impact? Dr. Shapoff is the Director of the American Board of Periodontology. He has published widely, lectured internationally, and serves as a consultant to several major research organizations. He maintains an implant-oriented practice in Fairfield, Connecticut. 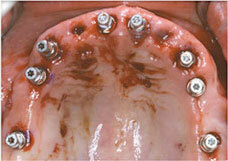 Decision Making: What is the Conservative Implant Treatment? Dr. Moriarty is a Clinical Professor in the Department of Periodontology at the University of North Carolina at Chapel Hill. Dr. Moriarty became a Diplomate of the American Academy of Periodontology in 1983. 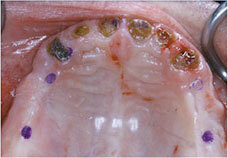 He maintained a clinical practice in the Dental Faculty Practice fro 28 years. Presently, he practices two days per week in Cary, North Carolina. Dr. Moriarty has won multiple teaching awards at UNC-Chapel Hill. He served as the Director of the Undergraduate Program in Periodontics for 20 years. He served as the Director of the Dental Implant Program for the School of Dentistry from 1998-2005. He is currently the Vice-chair for the Education Committee of the American Academy of Periodontology. He has presented over 150 lectures and seminars, nationally and internationally. Dr. Malin graduated from Marquette University in 1991. He maintains a private practice in LaCrosse, WI where he has been utilizing occlusal based dental concepts since 1998. Early in his career, he discovered that the implant placement techniques used could not deliver a standard, predictable result. Therefore, with the help of other experts in the fields of radiology and occlusion, Dr. Malin developed an implant placement technique which focused on occlusion (and cosmetics) for implant placement and crown restoration. This technique has led to five patients pending along with exceptional implant results. Dr. Malin lectures throughout North America on full-mouth reconstructions and implant placement. Dr. Malin is the Director of Implantology at the Las Vegas Institute for Advanced Dental Studies (LVI). Dr. McGarry received his DDS from the University of Missouri at Kansas City and his Certificate of Prosthodontics from UCSF/VA San Francisco. In addition to being Board Certified by the American Board of Prosthodontics, Dr. McGarry is currently a fellow of the American College of Prosthodontists where he served as president from 2000-2001. He is the Founder of the Oklahoma Society of Prosthodontists and the Director of the McGarry Implant Institute. Dr. McGarry maintains a full time Prosthodontic practice in Oklahoma City. Dr. Russo is a diplomate of the International Congress of Oral Implantologists. He is in private practice in Sarasota, Florida, and is a Clinical Assistant Professor at the Medical University of South Carolina in the Department of Periodontics. He is an author and an international lecturer on bone grafting and dental implant surgery. Dr. Lingle is a Fellow in the ICIO and an Associate Fellow of both the American College of Oral Implantology and the American Association of Osseointegration. He lectures extensively on implantology and bone grafting. Having developed and taught numerous hands-on workshops, Dr. Lingle was awarded the 2005 Outstanding Service Award by the Minnesota Dental Association. He currently maintains a private practice in St. Paul, Minnesota. Dr. Hebel is a published author and lectures nationally and internationally on all phases of restorative and implant dentistry. He is the director of the Hands On Institute, where he provides extensive hands-on surgical and prosthetic training in implantology, and he is an Adjunct Professor at the School of Dentistry, University of Ontario, Canada. He is a certified peridontist and maintains a private practice in Ontario providing advanced surgical and prosthetic phases of implant dentistry. Dr. Daulton Keith maintains a private practice in Periodontics in Charleston, South Carolina. He is a graduate of the Medical College of Virginia and Boston Univeristy’s School of Graduate Dentistry in Periodontics. Dr. Keith serves on the faculty of the Medical University of South Carolina, College of Dental Medicine, as a Clinical Professor in the Division of Graduate Periodontics. He lectures nationally and internationally, has published several articles in national dental journals regarding implantology and block bone grafting. Dr. McCracken currently serves as an Associate Professor at the University of Alabama School of Dentistry in Birmingham, Alabama, in the Department of Prosthodontics. He is the Director of Pre-doctoral Implant Education at UAB and also teaches implantology at the residency level. Dr. McCracken has published multiple articles relating to biomaterials, bone-implant interactions, and clinical implant dentistry. He currently serves as a section editor for the Journal of Prosthodontics. Dr. McCracken lectures nationally and internationally on subjects relating to implant dentistry. Dr. Reddy is a graduate of Harvard School of Dental Medicine where he earned his DMD degree, Certificate of Periodontology and Doctorate of Medical Sciences Degree in Oral Biology. He is a Diplomate of the American Board of Periodontology as well as the Assistant Dean for Planning and Clinical Activity at the University of Alabama at Birmingham School of Dentistry. He is actively involved in teaching the placement of implants at the graduate residency level and has lectured extensively on this and restorative topics. His areas of research also focus on implantology. Dr. Reddy’s clinical interests include bone grafting, implant placement, and esthetics of implants. Dr. Keeney received his DDS with honors at the Medical College of Virginia in 1984 and obtained an early externship in Oral and Maxilofacial Surgery at The Jackson Memorial Hospital Trauma Center in Miami, FL. He completed this residency at the University of Pennsylvania in 1987 where he served as Chief Resident. He maintains a practice in Oral and Maxilofacial Surgery with a concentration in implant surgery. As a cofouder of the Implant Forum of Virginia, Dr. Keeney has worked to bring advanced implant techniques to the Richmond Dental Community. He i8s a Diplomate in the American Board of Oral and Maxilofacial Surgery, a Fellow in the American Association of Oral Surgeons and American Society of Dental Anesthesia and became the first active Board Certified Oral Surgeon in Virginia to become a Diplomate in the International Congress of Oral Implantology. He is a frequent lecturer and active in the used of 3-D CAT scan technology in implant treatment. Dr. Hamrick is a past president of the South Carolina Society of Periodontics and the Greenville Dental Society. He currently maintains privileges with the Greenville Hospital System and is a past chairman of its Department of Dentistry. Dr. Hamrick is Board Certified by the American Board of Periodontology and is a member of the Southern Academy of Periodontology, and the American Academy of Osseointegration. He is a member of the academic faculty of the Medical University of South Carolina’s College of Dental Medicine and has lectures locally and nationally. Dr. Hamrick has maintained a private practice in Greenville, South Carolina for more than twenty years. Mr. Carlson has been in the profession of dentistry for over 35 years with the last 19 focused on implant dentistry. She trains implant teams throughout the global dental community and provides cutting-edge clinical and processional development programs. She is a graduate of Indiana University’s Certified Dental Assisting Program and is the co-founder of The Implant Consortium, an educational resource for dental implant professionals. Ms. Carlson is a Fellow and a founding Certified Educator of the Association of Dental Implant Auxiliaries (ADIA); she received the 2008 ADIA Educator of the Year Award. Mr. Carlson is a Certified Dental Technician with 28 years of dental experience. He has worked in all facets of the dental laboratory and has provided hundreds of chair-side “coaching” sessions to implant manufacturers. Jeff is the primary author of a 300-page, fully illustrated “cookbook” for restorative doctors and is a co-developer of a restorative base training program for doctors and auxiliaries entitled, Support Plus, which has been attended nationally and internationally by over 11,000 professionals. Jeff has lectures throughout North America, England, Singapore, Sweden, China, Japan, Korea, Taiwan, and Spain, providing general dentists with a “Methodology to the Madness” in the area of dental implants. Making dental implants predictable, profitable, and fun! The Triangle Dental Institute has been designated an approved sponsor by the Academy of General Dentistry and AGD credits applicable towards membership maintenance and FAGD/MAGD will be submitted through this sponsorship. the ICOI is a recognized ADA CERP provider for credits. Fees are for cash/check payments. Credit card payments require an additional 2% transaction fee. Registration includes the lecture sessions, case work-up for your patient, surgical stent fabrication for your patient, hands-on surgical and prosthetic workshops, daily continental breakfast and lunch, refreshment breaks, hand-outs and other course materials, Certificate of Completion for 216 continuing education credits, consultations by phone or e-mail, and a Graduation Eve dinner. Charge my deposit in the amount of $1,500 to my credit card. I also authorize balance to be divided into two equal payments and charged to my credit card on the specified dates. The $1,500 non-refundable deposit will hold your space. The remainder can be paid in two installments, half at the March 12th session and the other half at the June 11th session. In the unlikely event of this course’s cancellation, all feeds will be refunded which shall constitute full settlement. If alternate accommodations are desired, we will be happy to recommend a range of other hotels in the Chapel Hill area. This entry was posted by Dental Continuing Education on December 1, 2009 at 2:32 pm under Uncategorized. You can leave a response, or trackback from your own site. Follow any responses to this entry through the RSS 2.0 feed.